Like most rabid college football fans, the time between the national championship game in January and the following season opener in September (or late August depending on the year) is quite the change of pace than the usual fall weekends of guzzling beer, grilling out, and yelling at 18-22 year olds through a plasma television for their perceived athletic failures on the field. Obviously there are myriad things wrong with the above scenario, ranging from borderline alcoholism to rage issues at young adults, but in the time-honored tradition of ornery old timers, “I am what I am and if you don’t like it, you can proceed to piss off”. That time period between January and September is 8 months of tranquility, productivity, and focus on things other than MAC boxscores, but thankfully there’s a couple of weeks to knock the rust off your game before the regular season in the form of spring practice. The NCAA, they of the “Mandate Everything and Control All of our Subjects” school of leadership surprisingly has given the schools a bit of freedom when it comes to spring ball. Loose parameters exist like how many practices can be completed, the stretch of time you have to complete them, etc. but for the most part it’s up to the school to figure out when that best works into their schedule. For the 2012 edition of the Ball State University Cardinals, that time has come today. 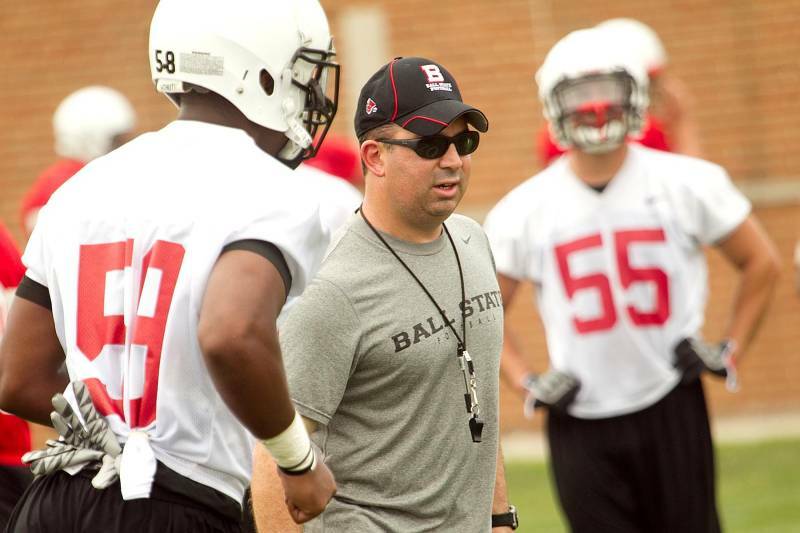 BSU’s first of 15 practices begins this afternoon at 3:30 at Scheumann Stadium and will conclude with the Spring Game on Saturday April 21 at 3pm. If you’ve never been to a BSU football practice before, I’d highly encourage you to check out the schedule at left. Honestly, you’ll get more out of the individual practices than you will the spring game, if it’s anything like years past with a non-game feel and more of a light scrimmage-type vibe to it. To be honest, the most information gained is about rising stars, team speed, and schematic familiarity with the returners. Truthfully, that’s about all spring practice is good for in terms of the common fan. Obviously the coaching staff is looking for different things and to measure offseason gains, but fans can’t take much (if anything) from practice sessions without most of the incoming freshmen.